Our bosses, governments and banks constantly degrade us and treat us all like ignorant, worthless, dumb scum. I say ENOUGH! Let me help you empower yourself NOW, before all financial hell breaks lose (which it will)... and after that, do whatever you want, whenever you want, however you want... no matter how dire the economic outcome may turn out to be! But one thing's for sure... it 'aint gonna be pretty and time's running out!!! The world economy is going to hell in a hand-basket, and we all know it... no point denying it anymore. Right? What are YOU going to do... sink, or swim? Fortunately, there still ARE people, able and willing to help. But you also have to help yourself! 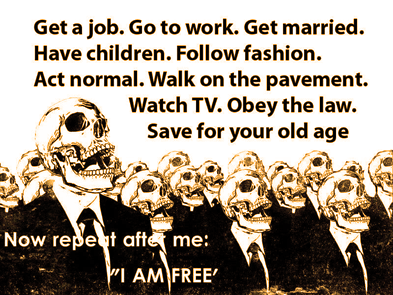 If you are finally prepared to crack open your freedom mentality, then start studying this site. "Crank up the volume and sing along... seriously! The time for fun starts NOW :-)"
FUN is something which the 'system' - that has apparently educated us, encouraged declining jobs, provided horendous healthcare, and is now filling the pockets of greedy bankers with billions in bailouts (the same bankers who created the mess in the first place) - yes, this same system has totally forgotten about us having a LIFE! You Can’t Make This Stuff Up!!! The 2012 Nobel Peace Prize Goes to the European Union. WHAT? This has got to be a sick joke, right? WRONG! They’re actually serious!!! Are people starting to wake up yet??? Nobel Farce Prize Won’t Save EU from Pain, Cuts & Riots!